Certainly one of the cuter species of rodent, prairie dogs are a communal critter consisting of five species. As with most rodents, they’re quite intelligent but inadvertently destructive, making it necessary to get rid of prairie dogs which find their way onto your property. As with all critters, the more you know about prairie dogs, the easier it is to deal with them. As prairie dogs are very aware of their surroundings, simply sticking a trap nearby won’t be enough. Instead, you’ll have to learn their weaknesses and exploit them to ensure these critters leave your property and stay away. Unlike most other common rodent invaders, these critters tend to be vocal. 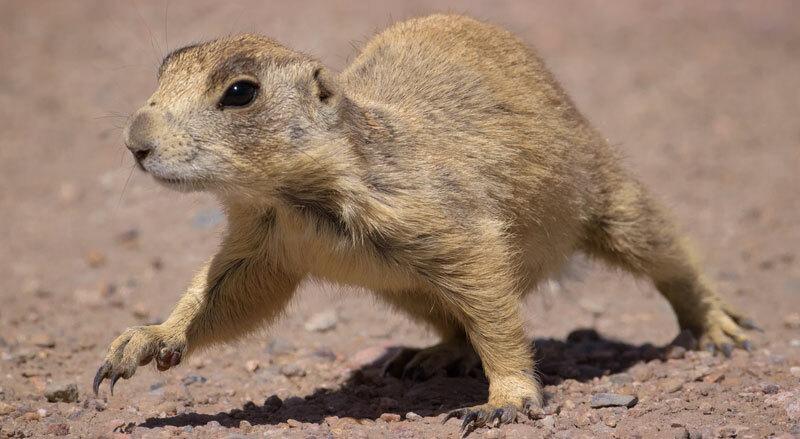 They got their name because a prairie dog sounds like a small dog when warning of predators or doing mating calls. This can often be the first sign you’ll get that a group are eyeing your property as potential real estate. Prairie dogs live mostly on grasses and roots, but will also eat fruits, seeds, grains, and even insects when they’re available. This makes them an absolute terror when loose in your garden or front lawn. Despite having lost up to 98 percent of their habitat, the efficient breeding habits of prairie dogs means an invasion onto your property can be one tough fight for survival. Once being in the entire midwest, prairie dogs have been in a state of decline, leaving them in about 11 states and one province in Canada. 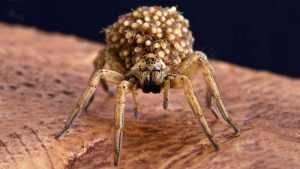 They’re highly social, burrowing deep underground into small communities, the entrances of which can be identified from a tall-ridged crater at the entrance. These entrances are designed to prevent flooding in a heavy rain, but are easy to spot. It also doubles as a sentry post. Underground, the entrance becomes a complex network of tunnels and rooms. The burrow (if you’re lucky) may consist of one family known as a cotery. Multiple coteries, known as a ward, may cohabitate together. In a worst case scenario, you may be facing a full colony (several wards). Mating season starts in March, and up to eight pups will be born around late April or May. This makes it extremely important to get any prairie dogs out before spring, as the population can easily grow out of control and devastate your garden or lawn. As mentioned, there are five different species of prairie dog, and knowing which one you’re dealing with can greatly affect the methods for getting rid of them. These rodents have lost the vast majority of their natural habitat, but their social structure and ability to quickly replenish a population means that most species aren’t currently on watch lists. As the name implies, these critters are easily identified by the black tip on their tail. The marking somewhat makes them look as though they dipped their tails in ink. As of 2009, this species was reviewed and deemed healthy enough to exclude them from endangered lists. This species has yellowish buff fur mixed with black and a white-tipped tail. While denied endangered status in 2014, it should be noted that this is an extremely important keystone species in their native habitat and should thus still be treated with some level of care. 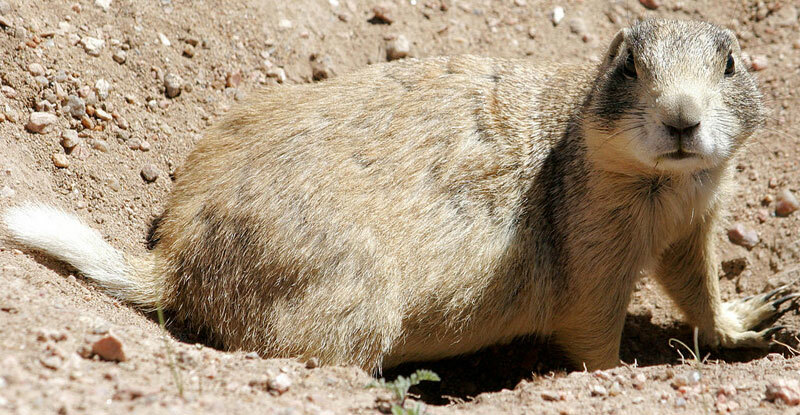 You can find Gunnison’s prairie dogs in the four-corners region of Arizona, Colorado, New Mexico, and Utah. With reddish-brown fur and a lighter underbelly, Mexican prairie dogs can be easier to identify than other species. They have a black tail tip which covers nearly half the tail, unlike the black-tipped species. This species is currently on the endangered list and should be treated with care. The most striking feature of these cinnamon to clay colored critters are the dark eyebrows which give them an almost comical appearance. They have white tips on their tails and are currently on the endangered species list. 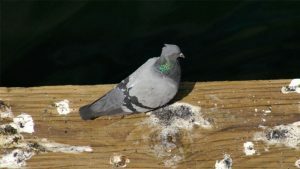 These tannish-brown pelted critters have darker brown streaks reaching from above the eyes down the cheeks and a short, white-tipped tail. 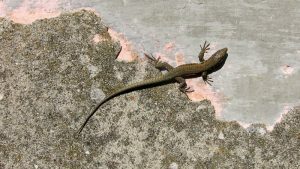 A survey of the species in 2010 deemed it as non-endangered. 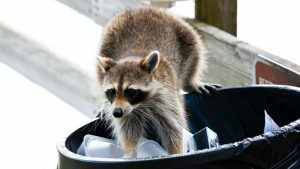 While the two rodents may seem alike at first glance, certain behaviors can help you distinguish which you have on your property. 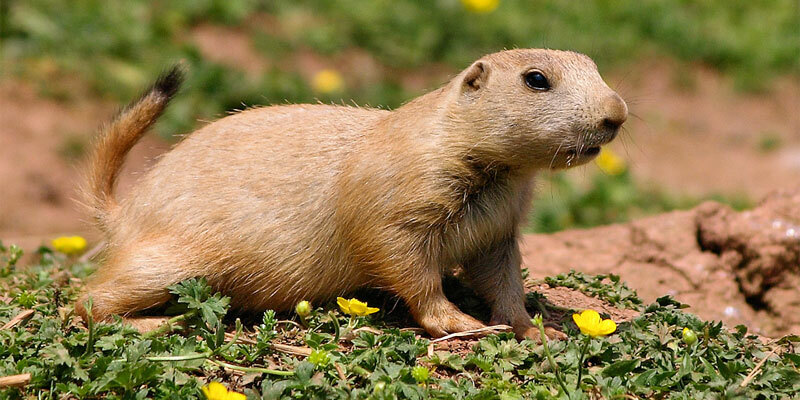 For example, prairie dogs are highly social and breed annually, whereas gophers are solitary and breed all year around. 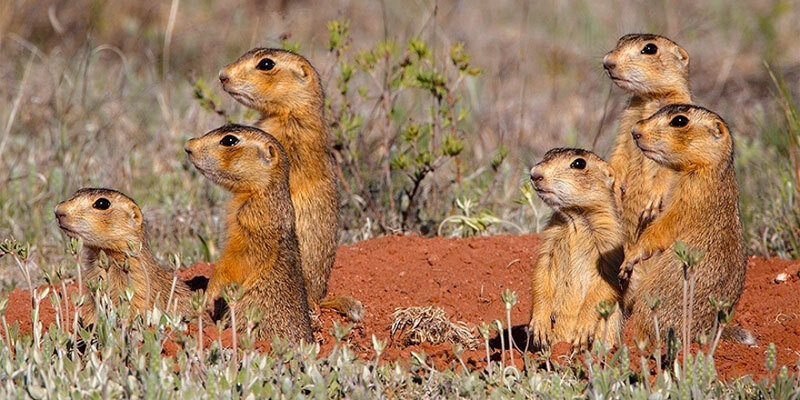 The entrance to a gopher’s burrow will be plugged, but prairie dogs keep the door open. You are also much more likely to see a prairie dog eating in the yard, since gophers pull their food underground to eat in the safety of their burrow. Groundhogs grow to be up to twice the size of a prairie dog. They also live in much smaller groups, with burrows shared by only three or four individuals that use it primarily for hibernation and avoiding predators. Prairie dogs, meanwhile, will almost always have a sentry posted outside of the burrow. 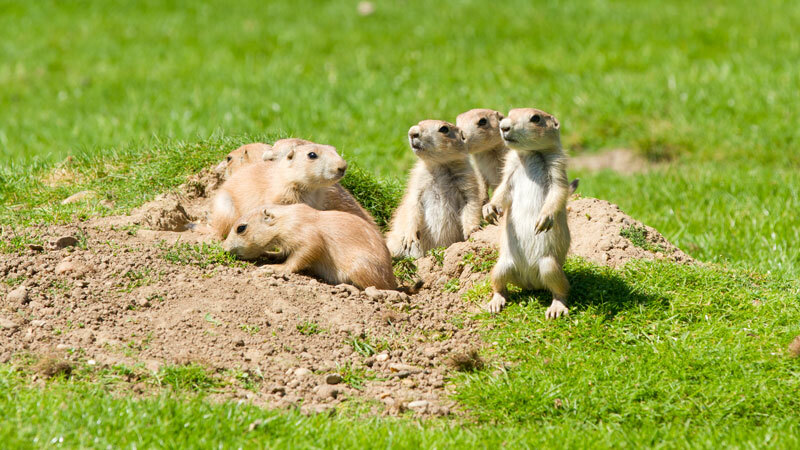 Due to their highly social nature, spotting one prairie dog means you’re likely dealing with a whole colony. They can be a nightmare to get rid of, as they multiple quickly and older prairie dogs will actively avoid traps. Thankfully, there are ways to reduce the population and, ultimately, get them to leave your property. Unlike most critters you might have to deal with, prairie dogs actually hate ground cover. Tall grass and obstacles prevent sentries from spotting an approaching sentry. Use this to your advantage by adding large stones or ground cover near each prairie dog hole. This can be the toughest scenario to solve, as prairie dogs will have plenty of roots and grass to gnaw on. You can uproot any plants that may provide root food and keep the grasses short in combination with traps and repellent, but this can be a slow and frustrating process. Alternatively, you can rototill the entire field, leveling it out with a tractor blade or performing a controlled burning to eliminate food and discourage burrowing. This can be a lengthy process, with a wait of up to two years before it’s wise to plant crops. However, the remedy can do a good job of evicting even large colonies. Sheds are one of the few places traps will actually work well against prairie dogs. Once you know how to trap a prairie dog in an enclosed space, they can become desperate enough to enter baited traps for food. As you’ll be working with a very small population, we suggest a good no-kill trap, such as the Havahart 1089. Ensure there are no easy escape routes from the shed and set your traps. Keep the shed locked so family members won’t accidentally let the critters out and check periodically for successful captures. Be sure to relocate the prairie dogs soon after capture. Prairie dogs can decimate a well-manicured lawn quickly, leaving an expensive repair job behind. Unfortunately, the only way to really get rid of them is through flooding the den. Most of the prairie dogs will escape, but a few will likely drown. Always be sure to identify the species before attempting this method. You can also use a prairie dog repellent (such as predator urine) near burrow entrances to help encourage the critters to vacate your lawn, but this works best when you have a very small group of prairie dogs and can locate most of the burrow entrances. This can be a worst-case scenario, as prairie dogs will devour the roots and many of your fruits and vegetables. A fence is the best option, but you will have to do some digging. Your fence should extend a few feet below ground so the prairie dogs can’t burrow down, as well as a couple feet above ground. In the event you already have prairie dogs in your garden, you may need to leave a small temporary opening and flood the burrow to evict those trapped within the garden enclosure. While we never condone the killing of beneficial critters, it’s not uncommon to see people killing these critters. Always be sure you’re not dealing with an endangered species before attempting any of these methods. Kill traps are a mixed bag. Not only will it require the same effort to place as a no-kill trap, you also run the risk of harming other critters. Worst of all, you’re likely to only kill a few pups, which will be quickly be replaced. Thus, this is an alternative best avoided. Poisons should never be used unless there’s no alternative, as other critters can fall prey to poisoned bait. This can be especially true with prairie dogs, as it can take days of baiting before you can lay out poison. Spread a heaping tablespoon of rolled oats around each prairie dog hole. Add another tablespoon every day until the prairie dogs begin eating it readily. Add a toxin (zinc phosphide, for example) to the oats as you continue baiting. Remove any corpses as soon as you spot them to avoid attracting (and harming) predator critters. While ill-advised for urban and rural homes, many country homesteaders actively shoot prairie dogs as a means of population control. This method has limited effect against the population, which can quickly recover from mild to moderate losses.